This healthy, hearty Indian-inspired stew makes great use of dried lentils, a staple in kitchens all over the world. Add in the sweet and smokey flavor of Jeff’s Naturals Roasted Bell Pepper Strips and sweet potatoes, and you’ve got yourself the perfect antidote to a cold winter’s night. For a fast weeknight meal or great lunches, make it ahead of time and keep in the refrigerator for up to 3 days. This stew is a meal by itself, but it’s outstanding when paired with a light salad and Garlic Pepper Toast or our other new recipe this month, Jalapeno Cornbread (recipe below). In a large stock pot, on medium-high heat, add the olive oil, onion, celery and carrot. Cook about 10 minutes, stirring frequently, until vegetables are tender and onions are translucent. Add the garam masala and stir for about 1 minute. Add the lentils and stock, bring to a boil and reduce to a simmer. Cover the top of the stock pot with the lid slightly off. Cook the lentils halfway, about 10 minutes, and add the sweet potato, kale and roasted peppers. Cook another 5-7 minutes, or until the sweet potatoes are tender. Remove from heat, season with salt and pepper to taste and serve hot. 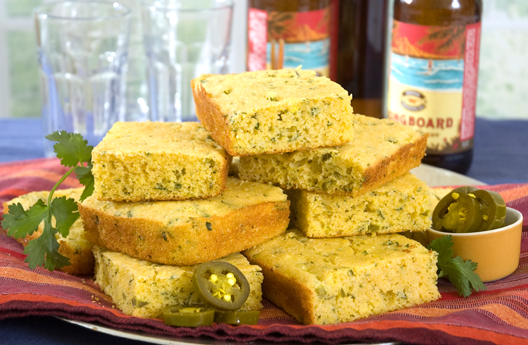 Our Diced Tamed™ Jalapeño Peppers add a tasty kick to this traditional cornbread recipe! Not only is it delicious, it’s so easy to make, even a kitchen novice can pull it off! This pairs with everything from Chicken Soup to Game Day Chili! For more delicious recipes using Jeff’s Naturals line of specialty olives, peppers and vegetables, please visit our Recipe Page.